When my boyfriend gave me a bottle of coffee liqueur bought this year’s Regional Flavours festival, I felt that I had to do something amazing to do it justice. But what? What could do it? That’s when it hit me. Muffins were among the first things that I made when I started to bake. Although my very first batch of muffins (banana walnut muffins) was an absolute disaster (shhhhhh), these hearty little treats shall forever hold a special place in my heart. So yeah, muffins it is. Moist, light and fluffy ones at that–is there any better way to kick off the day? 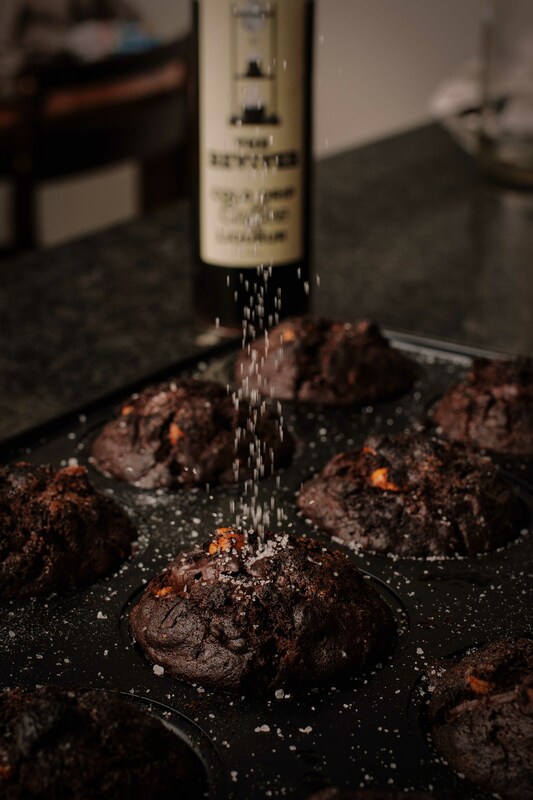 This recipe is inspired by the “Chocolate Espresso Muffin” by Christiann Koepke; her recipe had me so pumped when I saw it, as it smartly includes a few interesting twists on the standard ingredients. The combination of the sweetness from white and brown sugar balances well with dark chocolate; the moistness is given by the olive oil and yogurt, with the added richness of the coconut milk; and last but not least, the subtle fragrance coming from the coffee liqueur, it’s perfect. Altogether, this is going to make mind-blowing muffins with a smooth, seductive coffee hit. Not satisfied yet? Throw in some chopped hazelnuts – the best nut to pair with chocolate flavour in my opinion – and dark chocolate to give the muffins the needed crunch and gooeyness. I promise, with these gorgeous homemade muffins, your friends are going to love you, forevermore. Preheat oven to 375F (190C). Grease a 12-cup muffin pan with olive oil or line it with muffin liners. Prepare a double boiler. Carefully melt 100g dark chocolate with the double boiler the chocolate until smooth. Remove from heat and set aside. In a bowl, sift in and combine well flour, cocoa powder, baking powder, baking soda, and salt. In another bowl, whisk olive oil, sugar, eggs, Greek yogurt, coconut milk, and the melted chocolate until smooth. Pour the dry flour mixture into the wet ingredients in three batches. Stir the batter gently with a spatula until everything is just incorporated. Stir in the remaining 150g dark chocolate and hazelnuts. Fill the muffin tin ¾ full and sprinkle white sugar on each muffin cup. Bake the muffins for 18-20 minutes, or until a toothpick inserted in the muffin’s centre comes out clean. Let cool in the pan for at least 10 minutes, before carefully removing them from the pan to cool completely on a rack. Coffee in any form is a true winner haha!